Know what causes the most damage to a team’s productivity? Communication within an organization is often a battle. A war that ends up with missed targets, overworked and dissatisfied employees and frustrated bosses. Employees have little clarity about what the top bosses are trying to achieve. What does my company really expect from me? How does my contribution tie in with the big picture? What do I have to do to grow in the organization? And yet, the solution is simpler than we imagine. Internal communication is the process of communicating with your employees. It’s about making sure your employees understand what the company is trying to do and helping them be more productive at what they do. Exactly how does internal communication contribute to productivity? How can organizations do better at internal communication? Is internal communication only for established companies or can startups benefit from it too? Recently, we had the opportunity to talk to Mikael Lauharanta, Co-Founder and COO of Smarp – an app for employee communication, advocacy and engagement. 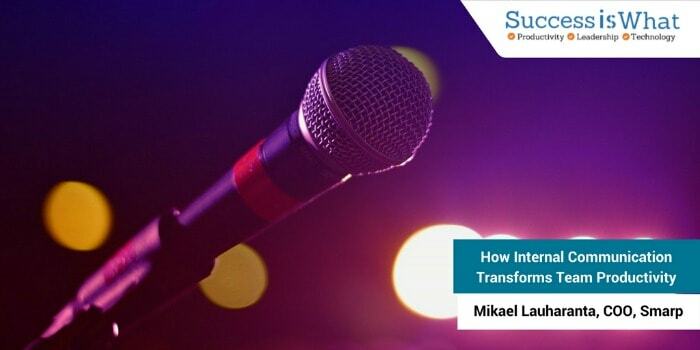 In this discussion, Mikael shared some great insights about how internal communication can be used to boost organizational productivity. How can better internal communication improve employee productivity? One of the biggest drivers of productivity in an organization is the level of employee engagement. Simple fact – an engaged employee will work harder, contribute better ideas, help out other teammates, and even energize people around him/her. Yet Gallup studies indicate that on average, only 32% of employees are engaged. Active internal communication keeps employees more engaged, which greatly improves productivity. Internal communication can be used for informing people about the current state of affairs in the company and the industry. This information helps employees understand the context behind their everyday tasks. The moment you know why you are doing something, and how it fits into the bigger picture, you feel part of something meaningful. This naturally inclines you to do a better job. Internal communication also brings more clarity to day to day operational tasks. For instance, when employees know where to find a specific bit of information or a document, it reduces frustration and time needed to perform tasks. The only constant in the 21st century is change. When there’s a systematic internal communication culture in place and people understand each other very well and what is expected of them, they function far more productively as a team. The company can be a lot more agile and react quickly to changes in the marketplace. More importantly, a more agile team can be proactive and become a market leader. Culture impacts productivity in several ways. You can use internal communication to shape and foster different aspects of culture such as organizational values, decision making styles and processes, your approach towards rewards and recognition and more. This creates greater alignment and fosters better teamwork. What are the most common mistakes that companies make in terms of internal communication and how could those mistakes hamper productivity? The biggest mistake in any sort of communication is making assumptions. If you assume the other party knows something they don’t, the quality of the work suffers and unexpected or even detrimental outcomes lead to frustration. Another very common mistake is to try to use too many channels. The fewer channels and file locations you have, the easier it is to find the information you need. Instead of using both Dropbox and Google Drive for storage, pick one that suits your organizational needs, and instead of using Whatsapp, Facebook messenger, and Slack for instant messaging, choose only one and stick with it. You can also think about combining your external and internal communication efforts with tools like Smarp versus having an intranet and then a platform for external sharing, for example. Last but not least, don’t forget that internal communication is best-done face to face so get up from your seat and start talking to people! Live meetings are always better than online meetings, but if you have to resort to online meetings, try to enable video so everyone can feel like they are taking part in the discussion. Why don’t more companies take steps to implement a structured internal communication system? What roadblocks do they face? I think companies struggle to understand the value of internal communication, even though one could argue that it is more important than external communication. After all, your employees are the ones who make or break your company. If they are not engaged and productive, what chance do you have of succeeding? The biggest issue is that it is harder to measure the soft values/benefits associated with internal communication, compared to the very tangible external communication metrics. This leads to companies not allocating enough resources/people to take care of internal communication. How can technology be utilized for improving internal communication? Ideally, you want to have a good mix of collaboration, video conferencing, chat, and content sharing tools (you don’t only use one channel for external comms either), as long as you keep the number of platforms to a minimum and maintain good communication as priority number one over fancy technology. Let’s say a company would like to take small steps towards implementing an internal communication system. How should they begin? What should they keep in mind? Don’t just get an internal communication platform and hope that will fix your problem! To fix your internal communication, you need to be clear about your objectives and what you want to communicate. Create an internal communication calendar and lay out what you want to communicate on a quarterly, monthly, weekly or ad-hoc basis. Make sure you are celebrating the small wins and letting people know when they have done a good job. Does investing in internal communication systems make sense only for large companies with more than 1000 employees? Or can mid-sized companies and startups also benefit from investing in it? We’re a company of around 60 people and internal communication and platforms are hugely important for us as well. As soon as everyone is not sitting around the same table anymore (for instance, in remote teams), you need to start thinking about internal communication. Of course, the benefits scale as the company gets bigger, but sometimes good internal communication is even more important for startups because you need to build trust from scratch instead of leaning on a huge brand. Let’s not forget that most startups shut down within a year of launch. Effective internal communication can greatly reduce chances of failure by building a more dedicated team, which works in sync. Can you share examples of a few companies that are doing really well at internal communication? Mikael: As an outsider, it’s harder to tell who are doing well with internal communication, but a good measuring stick is how well the company’s employees understand the company values and the direction of the company. I always like to highlight other Finnish companies, and one Finnish company that has implemented very good internal communication practices is Smartly.io. They have created a strong company culture by e.g. having regular team breakfasts, demo days, and one-on-one meetings with randomized employees. Another example of a slightly bigger, non-Finnish company is Hulu with their engaging social intranet Huluverse, where you can e.g. give kudos to your colleagues or “Hulugans” who have done a good job. Internal Communication is not just a buzzword anymore. It’s a powerful approach that can help your company become more agile, execute faster and reduce waste. In other words – become far more productive – and more profitable. What are you doing for internal communication in your company? Share your thoughts in the comments section.